Better known as "the Madame" to Chairman Mao, Jiang Qing never shied away from the grasping of power. 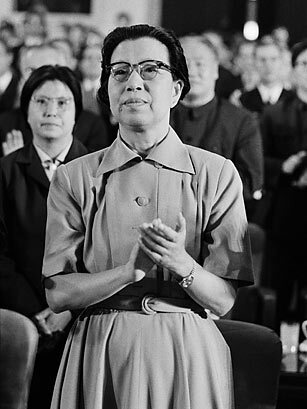 After a colorful adulthood that included an acting career, failed marriages and jail time for alleged radical activity  a past she took pains to erase later by ordering that any documents detailing her life be destroyed  Jiang became wife to Mao Zedong in 1938. She made constant bids for power up the ladder of the Communist Party and eventually came to lead the Gang of Four, whose members included Zhang Chunqiao, Yao Wenyuan and Wang Hongwen. Together they reigned over every cultural institution in China, ordered the destruction of countless ancient books, buildings and paintings and were responsible for the violent persecution of much of China's population. Death tolls from that time are unknown, but numbers run as high as 500,000 from 1966-69. While some historians claim the Gang of Four were the masterminds behind the Cultural Revolution, Jiang blamed Mao when she famously said, "I was Mao's dog; I bit whom he said to bite." Rather than apologize for the criminal charges against her, she spent a decade in prison before taking her life in 1991. See TIME's 1980 piece on Jiang's role in China's Cultural Revolution.